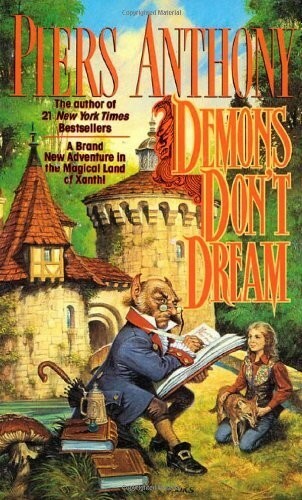 Demons Don't Dream begins a thrilling new Xanth sequence, as a pair of young adventurers play for the highest stakes of all: the future of Xanth--and of Earth as well! Drawn into Xanth by a harmless-looking computer game, two young people find themselves competing for a precious prize: Dug, who is beguiled by a beautiful serpent-princess, and Kim, who discovers her favorite fantasy realm has suddenly become frighteningly real. In a desperate race against time, dug and Kim battle their way across the wondrous, perilous land of Xanth, testing their courage against dozens of fearsome obstacles (and their wits against a host of outrageous puns!) But when treachery, danger, and deceit place Xanth itself in peril, Dug and Kim learn that some things are more important than winning or losing. A breathtaking, madcap quest filled with fearsome monsters and far-fetched fun, Demons Don't Dream is vintage Xanth, an unforgettable escapade from fantasy's most imaginative storyteller.